MFT has awarded grants to four farms of approximately $50,000 to implement changes in order to scale up their businesses. The farms participated in the 201 track of MFT’s Farming for Wholesale program and spent two years working with business advisors to research and define business plans focused on scaling up for wholesale markets. These implementation grants are competitive and applications undergo an extensive review process by a committee comprised of MFT staff and industry consultants. 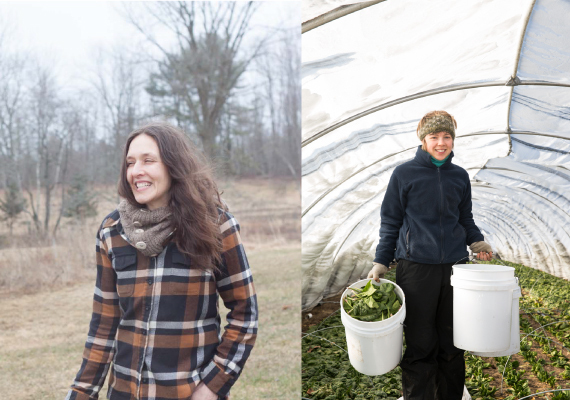 The 2018 crop of grantees, all of who received around $50,000, include Tide Mill Creamery in Edmunds, Two Farmers Farm in Scarborough, Herbal Revolution in Union, and Broadturn Farm in Scarborough. The farms will use the grant funds to scale-up infrastructure, equipment, and expand marketing efforts. Rachel Bell and Nate Horton of Tide Mill Creamery constructed new housing for their herd and made improvements to their pastures, and installed a 100-gallon vat pasteurizer, which will allow them to sell cheese across state lines. Kelsey Herrington and Dominic Pascarelli, of Two Farmers Farm, will implement a new business plan to sell more vegetables in mainstream markets while maintaining a high level of product quality, and quality of life. Kathi Langelier, of Herbal Revolution, created a plan that scales production to meet national demand for her herbal line. She will also invest in the business’ brand, and create new jobs in farm operations, sales, marketing, and production management. Farmers John Bliss and Stacy Brenner of Broadturn Farm are using the funds to cultivate their brand and marketing to create new opportunities within the floral industry. This includes infrastructure that will help them pave the way for the burgeoning local flower market.